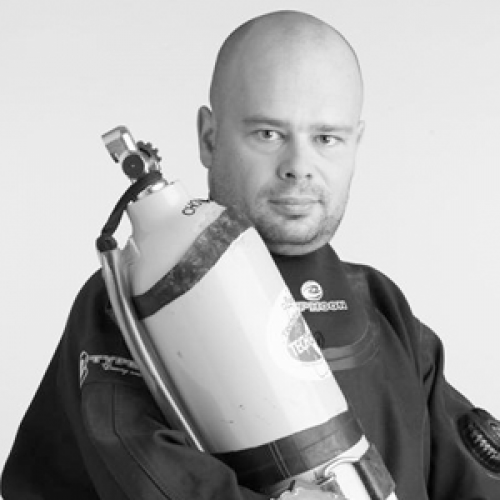 He took up tec diving in 2001 and in 2004 he became a first level tec diving instructor – an Advanced Nitrox instructor certified by IANTD (International Association of Nitrox and Technical Divers). In 2005, he became an ITDA (International Technical Diving Association) certified Extended Range and Trimix mod1 instructor. - attempt to break Poland's record in 2006, finished at 187 m.
- exploration of Ras Mamlah cave in Egypt; he was the first man to reach the 105 m deep bottom of the cave. - over 20 dives deeper than 140 m.
Currently, along with Andrew Gołka, he runs TechDive.pl, and he has begun developing the Diveright.pl diving portal promoting the right techniques and approach to the wide scope of diving-related issues. A tec and cave diver, having also other interests, ones that of course revolve around extreme sports such as paragliding and extreme cycling.